The elusive Treasure Goblin and his big ol’ bag of presents is a very welcomed sight to the adventuring Nephalem. However, this is not ideal when he scampers off into a group of angry demons. Whhyyy I just wanted loot! When you eventually catch up to the little bugger and mug him of all his goods, you might be lucky enough to get a Legendary! WORTH IT. Recently, I came across the all-mighty PUZZLE RING. It was a minor upgrade from my old ring, but more importantly, it gave me a faithful Treasure Goblin side kick. I’ve affectionately named him Gibbles, because reasons. BEST FRIENDS WITH THE BIG SCARY PUPPY. 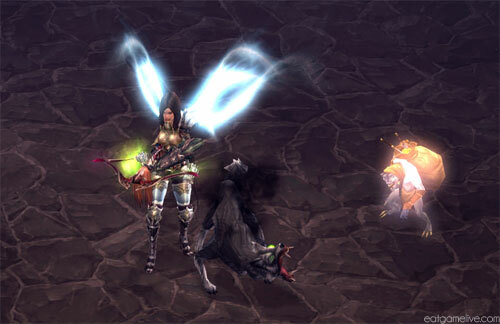 With the Puzzle Ring equipped, your Treasure Goblin companion will eagerly pick up common items. When he picks up 13 commons, he’ll drop a rare or legendary item. Farming for legendaries does make me quite hungry, and you definitely can’t go hunting loot on an empty stomach. 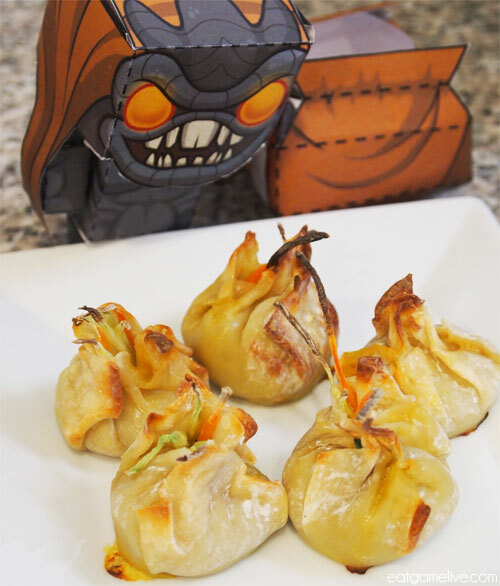 So, I’ve devised a GLORIOUS appetizer that is perfect for your next legendary adventure: Treasure Goblin Bags! These bags are stuffed with the nutrients you need to keep slayin’ demons. 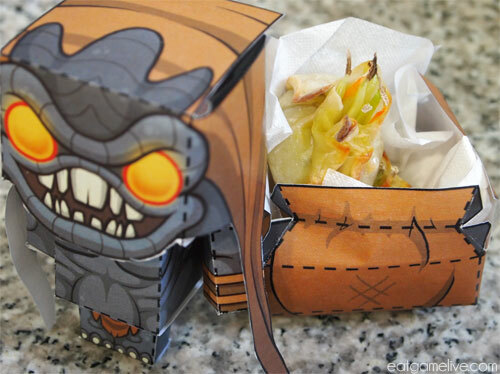 Since my Treasure Goblin buddy, Gibbles, only exists in-game, I’ve enlisted the help of Lewt the Papercraft Treasure Goblin to be my trusty sous chef for the day. *You can substitute tofu for the turkey to make this vegetarian friendly! Prep time is roughly 25 minutes. Cook time is about ~12 minutes. This will make 4 servings. 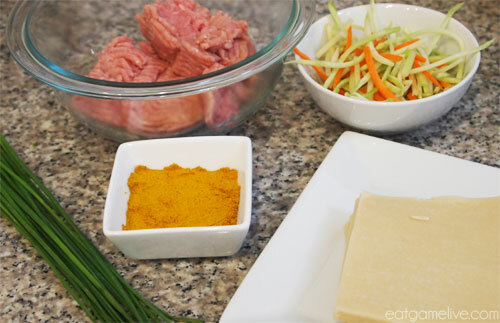 In a bowl, combine your salt, pepper, curry powder, chives, and chopped broccoli/carrot slaw with your ground turkey. 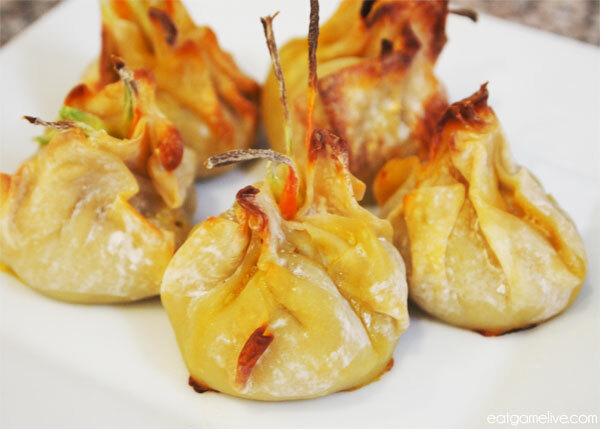 Take one wonton wrapper and place about a tablespoon of filling in the center of the wrapper. Dip your finger in water and moisten two edges of the wrapper. Fold the corners to create a triangle. Take the two bottom corners of the triangle and fold them to the center. 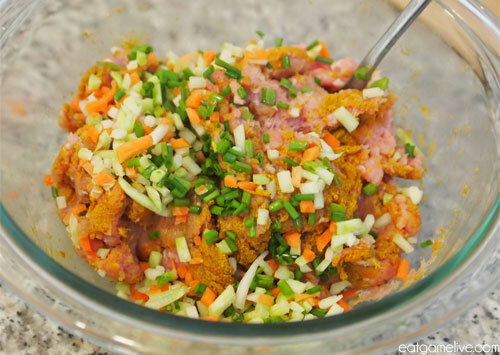 Place two sticks of carrot or broccoli from your slaw between the gaps. Crimp the edges at the top to form a small satchel shape. Preheat your oven to 400° F (~204° C). 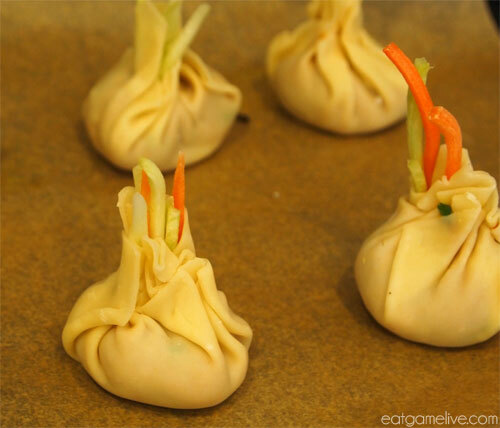 Place your treasure goblin bags on a baking tray and bake for about 12 minutes. Remove from oven and let cool for about 3 minutes. Ta-da! GG WP. Now you’ll have these delicious appetizers full of legendary deliciousness. Make sure you eat these quickly because you’ll never know when a Treasure Goblin might run off with them! Hey, whats in the bag? Oh, more bags. 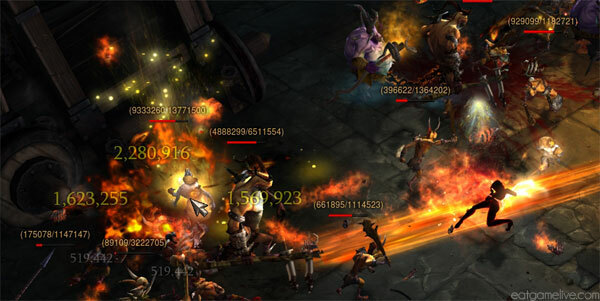 This entry was posted in diablo and tagged appetizers, diablo, diablo 3, treasure goblin, turkey, wonton by admin. Bookmark the permalink.